You read about our Eurostar “adventure” from London to Paris in my last blog post; Yikes! But after we got on the train, we had a lovely ride, a great driver to our Paris apartment and a warm welcome from Catherine, the apartment owner. 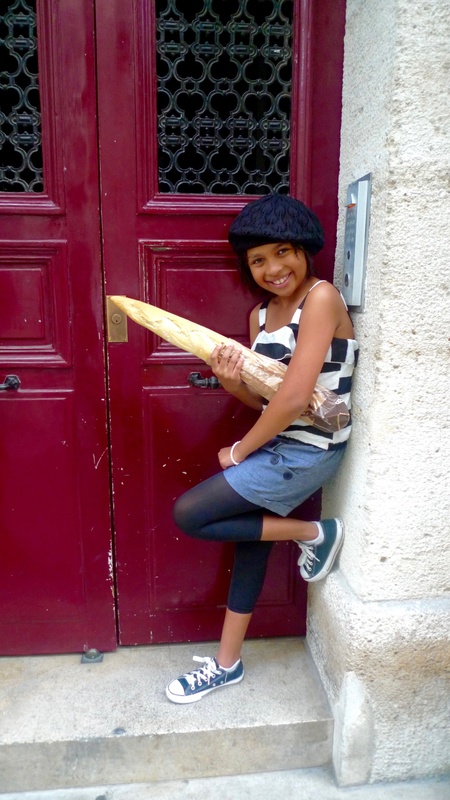 While researching Paris accommodations, it quickly became apparent that it would be better for my family to stay in an apartment rather than a hotel. Somehow I got to the website Haven In Paris and found a lovely apartment for rent in The Marais section of Paris (the 4th arrondissement). It was perfect! The apartment was stylish, stocked with everything we needed and spotless. Catherine even had a bottle of wine, bread, chocolate, fresh flowers and other goodies waiting for us. The location couldn’t have been better; we were near 2 metro stations, several bus lines and a few blocks walk to the Seine river. Best of all was the wealth of cafes, restaurants and shops right outside our door. It’s always tricky renting an apartment online, but we couldn’t have been more pleased. We made ourselves at home and felt very French. After a neighborhood tour from Catherine we took off on our own and over the next few days we explored the neighborhood and absolutely fell in love. We had our first macaron right down the street from our apartment at Maison Georges Larnicol on rue de Rivoli and after one bite we vowed to have as many macarons as possible while in Paris! They are insanely delicious! Delicate, yet bursting with flavor, each bite is heavenly. I don’t know how they pack all that flavor into such a little tiny cookie. You know my family, we like to review food, so look for a blog post comparing different macarons shops. 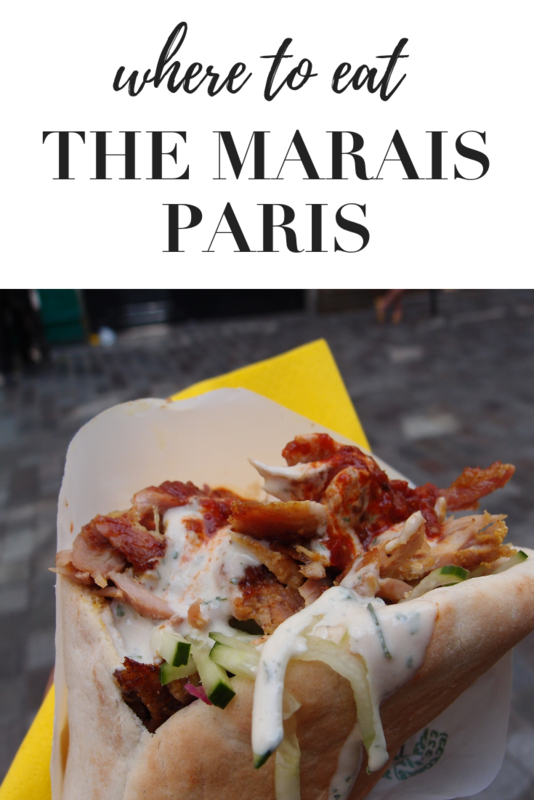 The food in Paris will make you dizzy; there is so much to eat! We at in several cafes and restaurants, had take out sandwiches from boulangeries and ate food at the grocery store as well. I couldn’t possibly comment on every cafe or restaurant, but believe me when I say that was pretty much ALL good! However, I must comment on a few establishments that were particularly outstanding right in our neighborhood. Every morning we had croissants from the corner boulangerie for breakfast and took a baguette in our day bag to snack on while touring. A few blocks away on rue Vieille du Temple were a couple of restaurants highly recommended by Catherine. She was correct; our meals at Le Petit Fer á Cheval and Les Philosophes were outstanding. I don’t eat beef, but I had to try a tiny bite of my son’s Beouf Bourguignon; wow! The meat was so tender and the red wine flavor was present, but not overpowering. It was incredible. Our neighborhood is also home to a famously delicious falafel place called L’As du Falafel. The lines are always insane but worth it. We got falafel and chicken shwarma to go and ate it on the street. It was huge – and delicious! We felt very lucky to be in The Marais, such a vibrant and charming neighborhood; our trip to Paris was off to a great start! *Read more about our Paris vacation, Sightseeing in Paris: Versailles Do or Die. Hi my husband and I are visiting Paris for the for the first time end May 2017. Would love to stay in the Marais area. Please can you let me know ne of apartment. Hello Premmie, Yes, I can give you that information. I’ll send you an email. Have a fantastic time in Paris! Your family is so adorable. You guys should have your own foodie-centric, travel’ish reality show. I’d totally watch you. I’ve been skimming through your posts for days, but am only now taking the time to comment and I have to say that you’ve swayed my stance on Paris. All the food talk and just the culture I’d be missing if I didn’t go someday. You’re very influential on a number of things–food, travel, and style included. Thank you; from your mouth to the Food Network executives ears! You must go to Paris one day! I promise that you’ll like it. There’s just so much to experience and it’s really very lovely. It would be a great trip for you and your teen girls, if not the whole family. Lovely! Makes me want to go back to Paris. 🙂 Must haves for me are croissant aux abricots and croque monsieur. Can’t eat enough of those! I wanna goooooo again now!!! Maybe next year?